Ariel Sands offers a charming holiday on a personal scale. Ariel is dedicated to offering guests the finest accommodations and personal service. This dedication was recognized in 2003 by being nominated for Conde Nasts Johansens award for Most Outstanding Hotel North America / Bermuda and also in 2002 by Travel and Leisure who included Ariel in their World’s Best Awards with a TOP 10 Award in the category of Hotel Services for Hotels in Bermuda, Bahamas and Caribbean. In 2003 Aqua restaurant was awarded 2 Medals from the Best of Bermuda Gold Awards for Best Chef and most Imaginative menu. The bar and restaurant is run by an outside catering company who dedicate all their time to producing exquisite food and service levels. 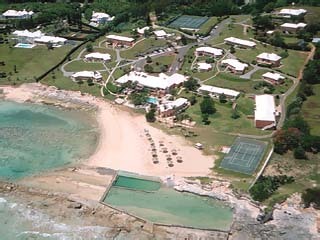 A bonafide Bermuda gem, this stunning 47 unit cottage colony nestles into 14 acres on Bermuda’s legendary South Shore. Here you’ll find dazzling ocean views from every cottage, a long list of on-property amenities and true Bermudan hospitality. The Hotel consists of Deluxe rooms, Superior rooms, One Bedroom Suite, Two Bedroom Cottage. Superior rooms may be a tad smaller or further away from the ocean, but a good value. One Bedroom Suite - The one-bedroom suite has a separate lounge and two separate bathrooms. Interiors of the cottages sport the Tommy Bahama line which has a traditional yet sun-drenched island-feel of ease and comfort . Some cottages have received the Nautica line throughout (such as the Michael Douglas cottage which has 2 bedrooms, living room with fireplace and dining area, 2 baths and eat-in kitchen). The look is warm, classic Bermudan and in keeping with the Plantation Theme. Mopeds and scooters can be hired. Tee off times for all nine golf courses on Bermuda can be arranged. Breakfast, lunch and dinner are served at Aqua, a gourmet seaside restaurant. Afternoon tea is complimentary and may be taken indoors or outdoors Cocktail hour is another pleasant ritual , and you do not want to miss the Swizzle Party held for guests every Thursday (in season). (April-November 1st). Guests are able to dine around at Cambridge Beaches or The Reefs or Coco Reef Bermuda.